The Nashville Predators will face the Anaheim Ducks in the Western Conference Final and it should be a doozy. The series marks the first time the Predators have been in the Western Conference Final and the fifth time the Ducks have had the chance. The path to here has been compelling for Nashville, as they swept the Chicago Blackhawks in the first round and defeated the St. Louis Blues in the second round. They are arguably on of the most well-rested teams remaining in these playoffs. The Ducks, meanwhile, swept the Calgary Flames in the first round and the series was closer than it appeared. They defeated the Edmonton Oilers in the second round, but it took seven games and came down to the wire on Wednesday night. The Ducks met the Predators in the 2016 Stanley Cup Playoffs – and lost in seven games. After five games, Anaheim was up 3-2 in the series. But the Predators came roaring back with back-to-back wins and took things home. Nashville also defeated the Ducks in the 2011 Western Conference Quarterfinals, by the way. Ryan Getzlaf led the way in goals, assists and points for the Ducks and was the best player on the ice most nights. He has 15 points, including eight goals and seven assists, and has been dominant throughout these playoffs so far. The Predators will be in tough against him, as he creates chances from the centre position and plays a strong possession game. Rickard Rakell has 10 points in 11 playoff games, including six goals, and he’s been averaging 19:40 of ice time a game. The 24-year-old has come up with timely goals and seems to be in the right place at the right time. His positioning is stellar. Jakob Silfverberg has also put up serious points for Anaheim. He has 11 points in 11 games, including seven goals and four assists. He averages 19:22 of ice time a game. Corey Perry had nine points in 11 games, but the Ducks would like him to find the scoreboard more against the Predators. He only has two goals in this post-season thus far. The Predators’ top line of Ryan Johansen, Victor Arvidsson and Filip Forsberg will handle most of the heavy lifting. They played well against the Blues in the second round, but there’s a sense that they’re capable of more. Anaheim will stack Ryan Kesler against the top line and hope his pesky presence will crack things open. But Johansen has the size to counter tight checking. He has nine points in 10 playoff games, including two goals, and he averages over 20 minutes of ice time a game. He has just 10 shots on goal, however. Forsberg has eight goals in 10 games and 28 shots on goal, while Arvidsson has five points in 10 games and 29 shots on target. Colton Sissons has six points in 10 games and could come up with some secondary scoring for Nashville. He averages 13:31 of ice time a game and had 11 shots on goal, plus he can slip into all three forward positions. 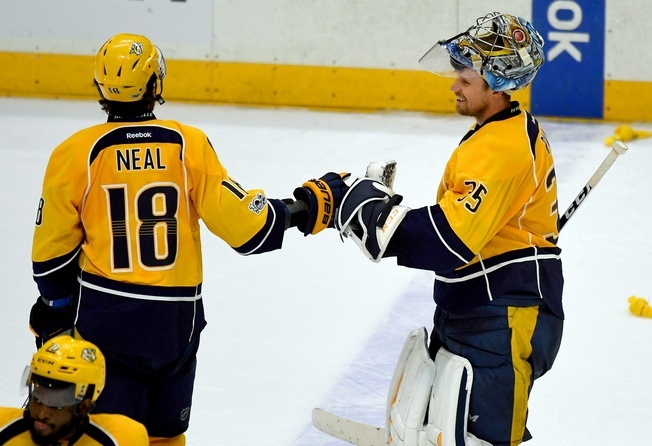 James Neal had three goals in 10 playoff games for a total of four points. He averages 17 minutes of ice time a game and clocked 28 shots on goal. Injuries have created problems for Anaheim’s defence, but they have the depth to overcome. Cam Fowler, Sami Vatanen and Kevin Bieksa have missed a combined 15 playoff games due to injury, which has put the spotlight on Shea Theodore and Brendan Montour. That’s not a bad thing. Theodore leads the Ducks’ blueliners with seven points in 11 games and has 20 shots on goal. He averages 18:18 of ice time a game and knows how to create chances. He moves the puck out of his zone and can crack the puck in from the point, plus he owns power play quarterbacking ability. Fowler has five points in seven playoff games and averages 26:06 of ice time a game with 14 shots on goal. Hampus Lindholm averages 22:20 of ice time a game and has three assists in 11 playoff games, with 11 shots on goal. The 23-year-old can play shutdown minutes and is versatile, which means Anaheim will use him in any and all game situations. The Predators will activate their defence and run their offensive attack from their own end, which tells you where the points will come from. Roman Josi, P.K. Subban, Ryan Ellis, and Mattias Ekholm have combined for 27 points in these playoffs so far and they’ve been playing an awful lot. Josi averages 25:34 a game and has eight points in 10 playoff games, including four goals and four assists. He has 28 shots on goal. Subban has seven points in 10 post-season games, including a goal. He averages 25:24 of ice time a game and has 17 shots on goal. Ellis averages 23:53 a game and has nine points in 10 games, while Ekholm averages nearly 25 minutes of ice time a game and has three assists. With the top four riding high in Nashville, that leaves Yannick Weber and Matt Irwin to pick up the balance. Weber averages 11:21 of ice time a game and had six shots on goal, while Irwin averages nearly a dozen minutes a game and had five shots on goal. The well-worn cliché about goaltending winning games will bear out once more in this series, as Anaheim netminder John Gibson ties up with Pekka Rinne. Gibson has a 2.80 goals against average with a .908 save percentage in these playoffs so far and he’s struggled against strong offensive pressure. He’s also capable of bouncing back, though. Jonathan Bernier saw 85 minutes of action in this year’s playoffs thus far and could be called on against the Predators if Gibson struggles. He’s got a 2.84 goals against average with a .911 save percentage, allowing four goals in 45 shots. Bernier is a quality reflex goalie, but focus can be an issue. Rinne has been hot since March. He’s got a 1.37 goals against average in the 2017 playoffs and a .951 save percentage, with two shutouts under his belt. He has an impeccable glove hand and can control rebounds, plus he’s improved in the puck-handling category. 22-year-old Finnish netminder Juuse Saros is the backup but he hasn’t been called on yet. He excels when it comes to reading shooters and was 10-8-3 in the regular season, with a .923 save percentage and a 2.35 goals against average. Nashville is riding a wave of momentum going into this series, but the Ducks are a tough team. They’re a bigger team and they could dominate in the physical arena, but the Predators can carry the puck out of trouble. And if rest is a factor, Nashville could pull off the advantage. The Ducks will have less than 48 hours between the end of their series with Edmonton and the first game of their series with the Predators, plus injuries to Kevin Bieksa and Patrick Eaves could be problematic. My call: Anaheim in seven.